LandschappenNL is a non-governmental organization (NGO) involved in nature and countryside management in the Netherlands. LandschappenNL is an independent umbrella organisation representing 20 provincial organisations. Many organisations in our partnership (“Landschappen”) implement nature conservation and conservation of heritage on their own territories. This concerns approximately 110.000 hectares of natural area throughout the country, especially in the Dutch National Nature Network, such as forests, meadows, fields, moors, fens, marshes, coastal dunes and salt marshes, but also monumental wind mills, estates with castles, historic farms etc. These “Landschappen” also own and manage sites that are part of Natura2000. LandschappenNL also represents organisations concerned with landscape management without owning land. Altogether these organisations carry into effect the conservation, restoration and development of nature reserves and heritage sites as well as maintenance of small landscape elements on terrains of others such as reed lands, hedgerows, rows of pruned willow trees, ponds, fruit orchards, historic footpaths and prehistoric burial mounds. The mission of the central office of LandschappenNL is therefore to facilitate and support provincial organisations by taking care of national interests and thus contributing to development, management and conservation of nature, landscape and cultural heritage, and the engagement of citizens. An interesting national initiative by LandschappenNL, in cooperation with other parties, is the Natuurwerkdag (“Nature Working Day”). 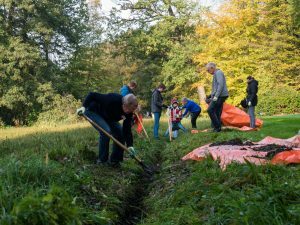 Every year on the first Saturday of November we work together with more than 15.000 volunteers in natural sites on the maintenance. Most of the people joining us that day do so for the first time and see it as an opportunity to get acquainted with the work needed to manage nature in the Netherlands. It is a great activity to raise awareness. Other initiatives and project worth mentioning here are ‘Kracht van de Groene Vrijwilliger’ (“The Power of the Green Volunteer”), ‘Natuurlijke Klimaatbuffers’ (“Natural climate Buffers”), ‘Ruimte voor Levende Rivieren’ (“Room for Living Rivers”), the Landscape Observatory, National Week of the Landscape, ‘Deltaplan Biodiversiteitsherstel’ (National plan for biodiversity restoration). EEB membership makes it possible for LandschappenNL to stay more adequately informed about international policies such as CAP and Bird and Habitat Directives. Also, direct contacts with EU administrators can be made possible. Through EEB we see ways to establish direct influence on policy makers of the EU. This would highly enrich the lobby activities of LandschappenNL which are until now to a high extend confined to the national level. Moreover, EEB is for LandschappenNL a perfect platform to get into contact with sister organisations all over Europe. One of our recent success stories concerns our wild bees project. Wild bees are more and more under threat. More than half of the 350 species known in The Netherlands are on the red list of endangered species. Most wild bee species are depending on specific plants and this makes them very vulnerable. Measures to support wild bees will be beneficial to many more insects. To stop the downfall of wild bees LandschappenNL has set up a project to create and strengthen their natural habitats and improve and multiply suitable food and nesting places. These concerns landscape elements, open sandy places and flower rich meadows. During the last decades these places have become rare in the Dutch landscape mainly due to intensification of agriculture and green space maintenance. The project stimulates local authorities to manage green spaces in an insect friendly way. Through the construction of spatial networks of bee friendly elements, the essential connections of habitats is strengthened. The project connects this activity to the own residential areas of citizens close to their houses. ‘Every postal code area its own wild bee!’. The project created more than 300 new habitats for wild bees, connects existing habitats, introduces the value of wild bees to more than 500.000 citizens and organizes a Bee working day, while stimulating at least 100 municipalities to start bee friendly management and involving 50 companies in wild bee strategies and . Awareness raising is another important effect of this activity. A digital platform www.nederlandzoemt.nl (‘Holland buzzes’) has been set up to inform public and authorities about bees and their habitats in The Netherlands.